Make some noise for your 2016 PBA Governors Cup champs, the Barangay Ginebra San Miguel! 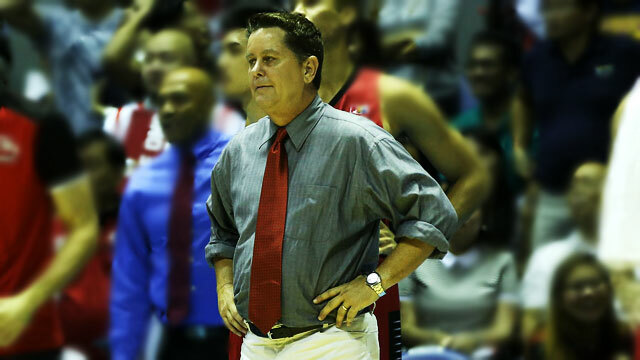 And while you're at it, celebrate once more the coaching genius of now 19-time PBA champion Tim Cone. "Papalit-palit kami ng coach nun, but when Tim Cone came he kinda settled us down," veteran wingman Mark Caguioa tearfully said in a post-game interview. Finals MVP L.A. Tenorio added after receiving his award from the PBA Press Corps: "Thank you to Coach Tim. Hindi ko alam kung bakit pag siya ang nagco-coach sa akin, ganito ang inilalaro ko." We're sure the answer to that is obvious even to the Little Tinyente and Ginebra's millions of fans. In the two-time PBA Grand Slam-winning tactician, Ginebra Gin Kings not only have a superb mentor with a keen basketball mind, but also a flexible players' coach. From his subtle lineup tinkering to his ultra-risky in-game moves, Coach Tim empowered his boys through out this competitive series against the very game Meralco Bolts, helping to capture for the country's most beloved pro hoops team its first championship in eight years. These six winning moves by the astute coach inspired his team to convincingly claw their way out of the kangkungan, becoming Kings of the PBA once more. Japeth Aguilar was a key contributor when it truly mattered. When he wasn't missing shots and hurrying his attempts, he was running back and foiling Meralco's numerous moves to score easy baskets on the inside. No one can also deny that Tim Cone motivated the high-flying Aguilar to unlock his monstrous abilities that have been shackled for so long. It seems like Japeth has only been waiting for the right teacher to come all this time. 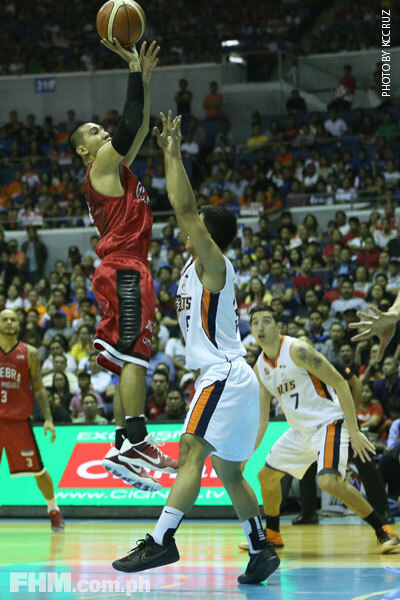 Under Tim Cone's watchful guidance, Aguilar, despite his momentary lapses, played like he was totally in control. All series long, Ginebra exploited Meralco's frontline defense with a play focused deep in the middle of the painted area. The receiver (either Aguilar, import and newly minted PBA legend Justin Brownlee, or Joe Devance) would catch the rock on this sweet spot and all he had to do was to turn towards the goal for an easy basket. It happened repeatedly that the Bolts looked quite helpless in stopping it. 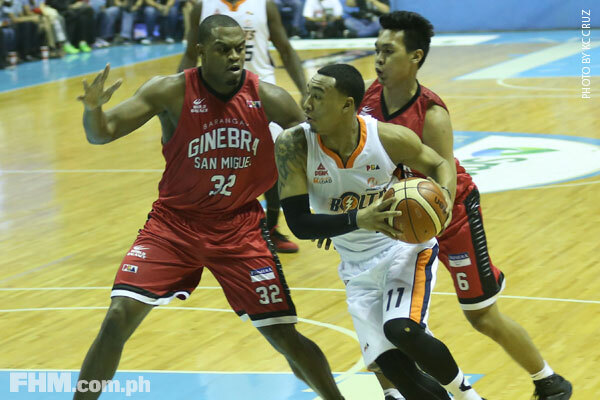 Perhaps, it was the Barangay's size over Meralco that gave Norman Black major headaches. Perhaps, it was the Gin Kings' pinpoint passing that confused the Bolts. What's beyond doubt was, Tim Cone knew when to maximize the physical and skills advantages of his boys over the opposing squad. Trailing the seemingly unstoppable Meralco by 16 points going into the fourth quarter of what turned out to be a memorable Game 4, Coach Tim dispatched 16-year vet and 2009 PBA MVP Jayjay Helterbrand (who was celebrating his 40th birthday) into the fray, a move that could very well be his his version of a Hail Mary pass. And the other half of the Ginebra's legendary Fast and Furious (Caguioa) duo responded with a game nothing short of inspirational. He scored 11 points in the quarter, punctuated with three triples that silenced the crowd, confused the hell out of Meralco's sputtering offense, and ignited a run that ultimately got the Gin Kings going en route to a breathtaking 88-86 victory. The out-of-nowhere instinct to call Helterbrand’s number turned out to be a game-winner for the Hall of Fame Coach. 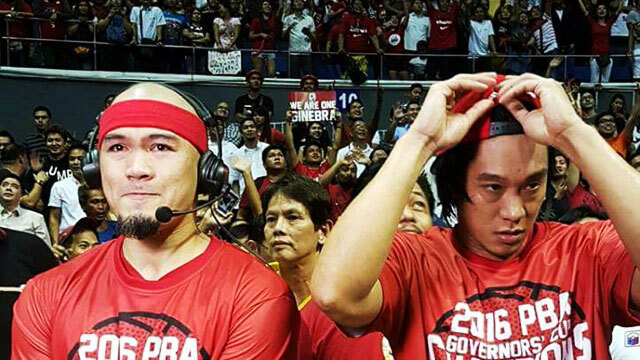 Caguioa's best days are behind him. But Coach Tim still found a way to utilize the Spark in a way that was still very much beneficial to the team. Upon his coach's urges, the once blazing Caguioa has become a gritty role player, throwing his body in every rebound opportunity while being content on on making the occasional but usually crucial and timely jumpers. With Coach Tim's prodding, The Spark, seemingly on the verge of conking out at times, still got himself jumpstarted to contribute the best way he could. Meralco's point guards, Jimmy Alapag and Anjo Caram are fast and dangerous. But they are tiny. Coach Tim must've taken notice. Every time an opportunity came, he'd signal for a post-play that put the dimunitive guards in precarious defensive positions against Tenorio, Caguioa, Sol Mercado or Scottie Thompson. That's Coach Tim, simply putting the 'Height Is Might' basketball axiom into action. 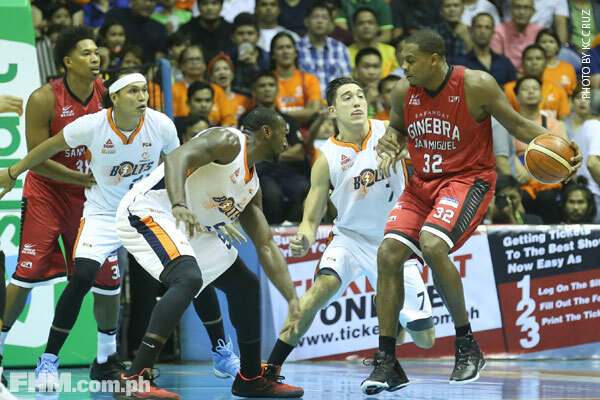 Yes, Ginebra never completely shut down Meralco's surprisingly fearsome offense. But they won their ninth crown in the league because they stifled the Bolts during the most important moments of the series. The biggest two examples of this happened at the end of Game 4 and in the first 40 minutes of Game 5. During the dying seconds of Game 4, Meralco's ageless and deadly Splash Manongs Alapag and Reynel Hugnatan were unable to touch the ball, resulting in a no-chance-in-hell double clutch fade-away by Chris Newsome. Meanwhile in Game 5, the Gin Kings fortified its defense down low, cornering Best Import Allen Durham into submitting one of his least impressive showing of the conference and rendering the rest of the Bolts' fiery outside game ineffective. These scenarios showed that Coach Tim is a two-way strategist, a competitor who's extremely difficult to outthink.